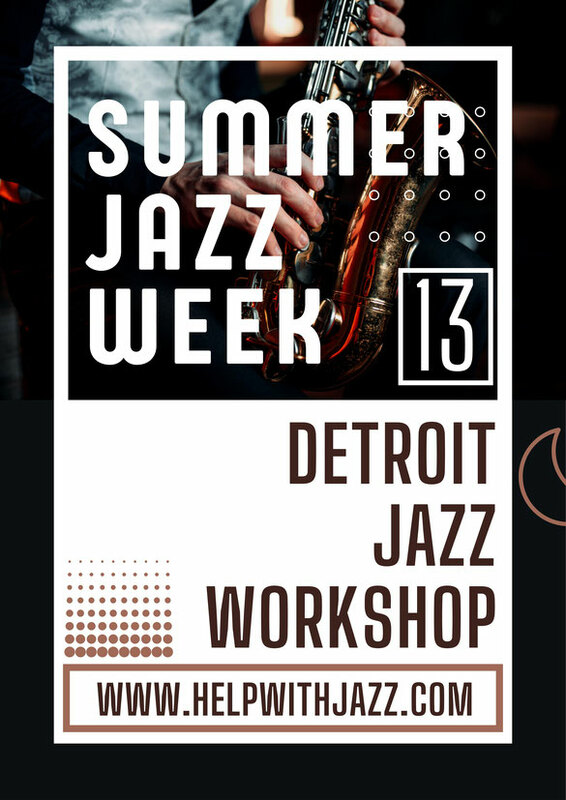 2019 Detroit Jazz Workshop - Website of helpwithjazz! July 8-12th - MSU Detroit Bldg. 10% early-bird tuition until Apr 1! We will be attempting to eliminate most the first day auditions by allowing you to submit them on video, whether on your desktop, laptop, or smart-phone. Auditions are for combo and vocal group placement as well as recommendations for level of study. You DO NOT need to submit an audition to participate in the workshop. See audition page for submission details. 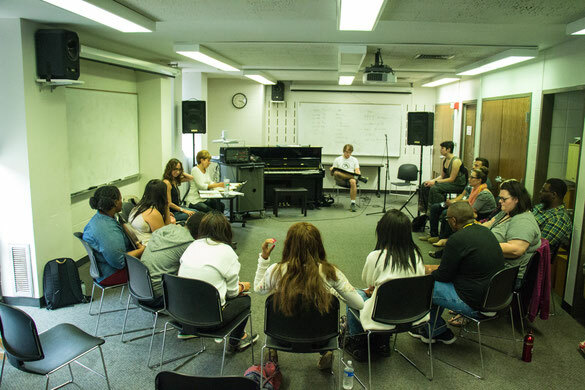 This year's workshop is July 8-12th at Michigan St. University's Detroit Campus- Community Music School. For more info on CMS's great programs for both young and adult music students, click here! 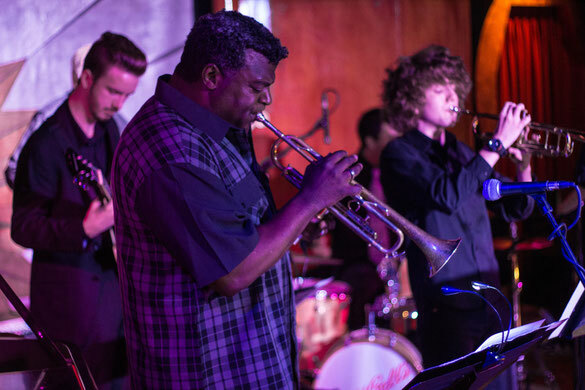 Our end-of-week performances will be at Cliff Bells Jazz Club on Sunday late afternoon, July, 14th (High School/Adult) and Monday evening, July 15th (Middle School / Jazz Vocalists) Check out Cliff Bells. Welcome to the internet home of the Detroit Jazz Workshop. This is your opportunity to learn about and sign up for an educational and fun experience for a week in July. The DJW is instructed by some of the best musicians in the region, most being respected university instructors and all top-level professionals. The DJW services all ages, levels, and backgrounds and is open to any instrument, traditional or not. This includes vocalists. WHO CAN TAKE PART IN THE JAZZ WORKSHOP? HOW CAN ALL OF THESE TYPES STUDY TOGETHER? The DJW has an incredibly diverse array of classes and clinics, starting at beginner to advanced level. The only commonality is that everyone learns about improvisation and performs with students of like-experience in a jazz concert at the end of the week. WHAT IS OFFERED TO STUDENTS? WHAT IS OFFERED TO MIDDLE SCHOOL STUDENTS? WHAT IS THE COST TO ATTEND WORKSHOP? The workshop is held this year at the music facilities at the MSU Detroit Center on 3408 Woodward Ave. Detroit, MI 48201. It is hosted by The MSU Community Music School. For people in SE Michigan, this an affordable alternative to out of town camps like Interlochen, Jamey Aebersold, and Blue Lake. You don't have to take a complete, room and board vacation to attend the DJW. If you are from out of town, we can assist in advice for arrangements food, lodging, and travel. Please take some time and browse this site. Check out photos from past years, instructor bios, testimonials, past guest artists, and class/clinic descriptions. Feel free to ask any questions. You can reserve your spot with a $50 application fee, payable online on Paypal or through check by mail. Tuition is due at workshop registration. There is limited room available, and enrollment is first come first serve. Make your plans now for yourself or the musician in your life who would benefit from a creative, educational, fun experience. 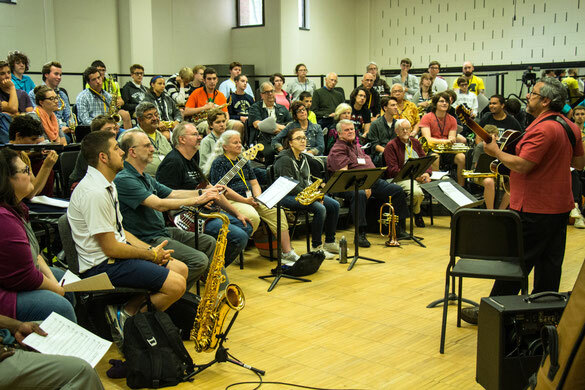 STUDENTS, WHAT DID YOU ENJOY MOST ABOUT THE Detroit Jazz Workshop? -I honestly had such an amazing week. I went to a camp at a university for saxophone last year and did not gain nearly as much knowledge there as I did in the just the first day of MDJW. I loved the master clinic with Damani Phillips. It was great to meet him and network a little bit. Skip Norris was fantastic also. I also loved how we could decide which classes to go to for improv and theory because I am somewhere in the middle of advanced and intermediate-it was perfect for me to customize my own schedule. Speaking of which, I loved Miles Brown's lectures on Free Improv-I gained so much knowledge from those sessions. Scott Gwinnell’s theory classes really helped me visualize the basics of jazz theory that I have never really been taught before. Overall I am so happy I did this, I am so excited to use the tools I learned and become an even better jazz musician. -The mix of ages and levels of the participants and the accessibility of the instructors. Great variety of subject matter to choose from. -Learning chords and how they can be applied to solos. -My combo, instruction by Russ Miller, master classes. -I have to say.....what I enjoyed most was singing at Cliff Bell's. For me, as a professional wanna be, I feel it is an honor and a thrill not only to sing.....but to be accompanied by the finest musicians in the metro Detroit area! -I enjoyed the instrument classes the most because it gave the most information and taught me the most about how to better play jazz throughout the week. -I'm very frugal with spending money for music education. I could have gone 2 hours a day instead of 7 and still got my money's worth. I look for blind spots -- areas that I never considered studying because I did not know they existed. It is also very useful to be reminded of lessons that I've neglected from the past. -Being surrounded by such knowledgeable teachers who were so open about sharing info. There was no feeling of competition or winning and losing. We all get enough of that on the outside, so it was refreshing to have a break from it. That said, there was still a feeling that everyone was trying to do their best, and this came as a result of the respectful encouragement of the staff. -Terrific program. I have enough material to practice until next year. -What I enjoyed most about the workshop was playing in the Jobim combo. -In general, it was really inspiring to be immersed in jazz for a week and to meet more professional musicians and fellow students. A couple highlights for me include participating in the master-class with Chris Buzzelli and the green composition class when we experimented with each other's original ideas. I also really enjoyed Russ Miller's simple structures class. I feel like there's enough for a lifetime in each one of those sessions. - College student of another major, guitarist.